Charlie Chan at the Opera was one of the later Fox productions of a Charlie Chan story. Made at a time when the series was worth of big budgets and big stars the film is a grand mystery of the sort they don't make any more. 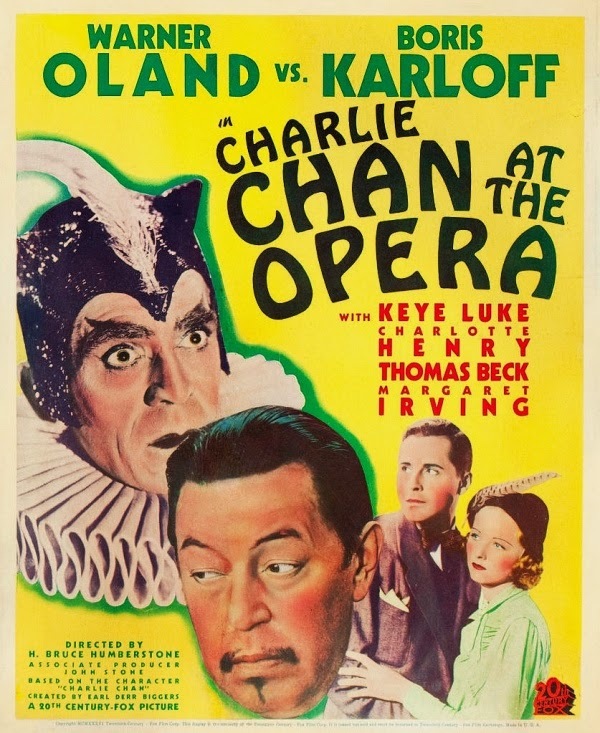 The film has Chan getting involved with the murders happening in and around an opera house. It seems that a crazed composer (Boris Karloff) has escaped from the asylum and plans to kill the man who wronged him. Its a wonderful production that is so lavish that the studio actually has a mini opera written just for the production. It looks and feels impressive and will surprise you if you've only seen the public domain ones not the ones that Fox produced. As a Chan film, it's one of the best. There is a genuine mystery here and the characters while stock still manage to grab you.To be certain the there had been a lot of films in the series -this is the thirteenth of forty four, but the film still had a lot of life in it and it wouldn't really begin to become mechanical until later into Sidney Toler's run at Monogram. Fox cared about the films and made sure that they were quality products because they were a cash cow for the studio.